Kents Cavern is run by Nick Powe, directly descended from George Smerdon, who led the small team of pioneering Victorian excavators for 15 years in Kents Cavern, revealing the scientific proof for the antiquity of humankind. Nick’s brother, father, grandfather and greatgrandfather have all played a valuable role in shaping the showcave we see today. After 15 years William Pengelly drew his Great Excavation to a close in June 1880 and he appointed his foreman, George Smerdon, custodian of the cavern. George Smerdon and his son-in-law Francis Powe rented the caves from Lord Haldon for many years until 1903 when Kents Cavern was put up for sale by the Haldon estate. On 23rd April 1903 Francis Powe became owner of what is now one of the most important prehistoric cave sites in Europe, recognised by UNESCO. On that day began a journey by one family to secure the protection of a prehistoric site. Kents Cavern today operates as a successful heritage attraction and is one of the best preserved natural caves in the country. Over a century later Kents Cavern is run by the 5th generation direct descendents of George Smerdon and the 23rd April is celebrated as Kents Cavern Day! Amazingly Kents Cavern has been a family business for 5 generations! Today the cave is run by Nick Powe, 5th generation owner who you might see around when you visit us! Nick and his wife Sheena both work here and they have four grown up children who have all worked at the caves. They also have two grandchildren who represent the 7th generation of the Powe family. Nick Powe has run the caves since 2000 when he took over from his father John. Nick has been instrumental in obtaining UNESCO Global Geopark status for Torbay and chairs the Geopark’s management organisation. He sits on the European Geoparks Network Coordination Committee. A renewed interest in scientific research at the caves and obtaining Gold tourism awards including best attraction in South West England and VisitEngland’s 2013 Tourism Superstar have led to increasing interest in visiting the caves. 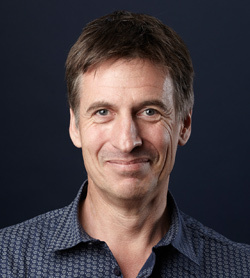 Nick begun his career in international finance and is married to Sheena, a chartered accountant, who takes care of the financial management and the retail buying operations. They have four grown-up children who have all worked at the caves and two grandchildren. 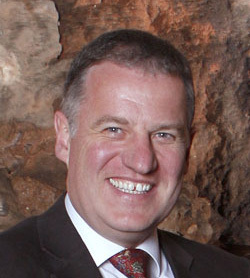 Tony Powe, Nick's brother, was general manager at Kents Cavern between 1990-1995. He was instrumental in introducing themed evening tours including the long running Ghost Tour which has now become a trademark of the Kents Cavern visitor experience. Tony left the business in 1995 to pursue business interests in New York where he lives today. John was born in Torquay and trained as a chartered accountant with local firm Bishop Fleming. He moved his family to the southwest of France in 1968 when John took up a finance role with Cognac Courvoisier. 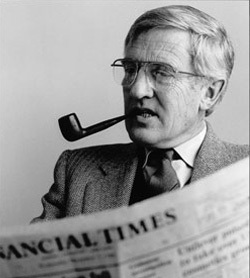 He later became Finance Director of the world famous Cognac firm. Nick, his brother Tony and sister Louise attended the local French primary school. They soon picked up the language and can still speak perfect French today. John retired back to Torquay in 1987 to take over the running of the caves from his father Leslie. He did not realise it at the time but his retirement would be far from relaxed. Despite being a popular visitor attraction, visitor numbers to the region and the caves had been in free fall since the mid-1980's and this trend was set to continue for the next 20 years. He ran the caves for 14 years but was taken ill in 2000 and died that year. Nick took over from him in the summer of 2000. 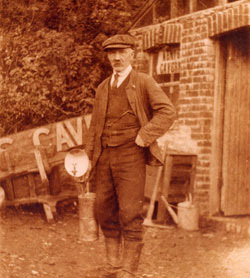 Leslie began working at Kents Cavern aged 20 and spent his life transforming the caverns into a viable business. He retired at 82 in 1987 and outlived his son, living to 97, just as his father had! The job of converting the cave from a Victorian excavation site to a visitor attraction was immense. Concrete paths were laid throughout, mains electricity was installed and the main hall (today's shop) was built, further buildings were then added in 1955. Leslie was to enjoy the fruits of his labours. From the 1950 until the mid-1980s, Torquay experienced a tourism boom which is unlikely to ever be repeated. Holidaying in the UK was extremely popular and Torquay was one of the main seaside towns, incredibly the season lasted from Easter until early October. Beaches were full, trains arrived packed and visitors to Kents Cavern were up to four times greater than today! 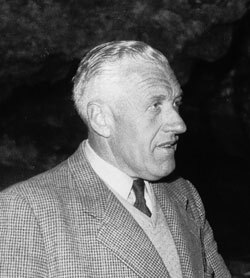 Francis and his father-in-law, George Smerdon, rented the caverns from Lord Haldon's estate from 1885 until April 1903. Francis was a carpenter and would walk from his home in Torquay to Teignmouth every day. He saw the caves as an opportunity to set up a workshop in Torquay and began to use the caves for his beach furniture business making bathing cabins, beach huts and boats, for nearby beaches at Anstey's Cove, Redgate beach and Meadfoot beach. In 1903 Lord Haldon's Torquay estate was put up for sale including the whole of the Ilsham valley. He could not afford the valley but managed to find enough to acquire the caverns, neighbouring woodlands and quarry (now the car park). On 23rd April 1903 Francis became the proprietor of what was to be confirmed as the most important prehistoric cave in North-West Europe. He developed a business selling kindling wood and stone and soon began to organise the occasional tour of the caves. Interest in visiting grew rapidly as a result of Pengelly's excavations and the prehistoric remains found inside. In 1925 Francis began to involve his teenage son Leslie and together they transformed Kents Cavern into the visitor attraction we see today - now known as a showcave. He died in November 1962 aged 96, 4 months after Nick Powe was born. Francis’ contribution to Torbay has been recognised. There is a lecture room at South Devon College University Centre named after him, the Powe room. George Smerdon came from Buckland-in-the-Moor and moved to Torquay to find work. 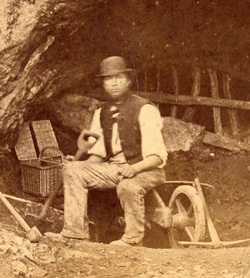 While working at a lime-kiln he was recruited to work under the Kents Cavern excavation site foreman Charles Keeping. Keeping and Smerdon excavated the cave looking for its ancient remains under the watchful eye of the Victorian natural history enthusiast William Pengelly. Pengelly's excavation method was pioneering and demanding, requiring accurate recording of every step. After two years Keeping resigned and George Smerdon was appointed foreman, a position he held for the next 13 years. A special relationship developed between George Smerdon and William Pengelly. At the end of the excavation, on 19th June 1880, William Pengelly organised a small pension and negotiated with the owner of the site, Lord Haldon, for George Smerdon to become custodian. His daughter Louisa married Francis Powe and so began an association between Kents Cavern and the same family which has lasted over 130 years.